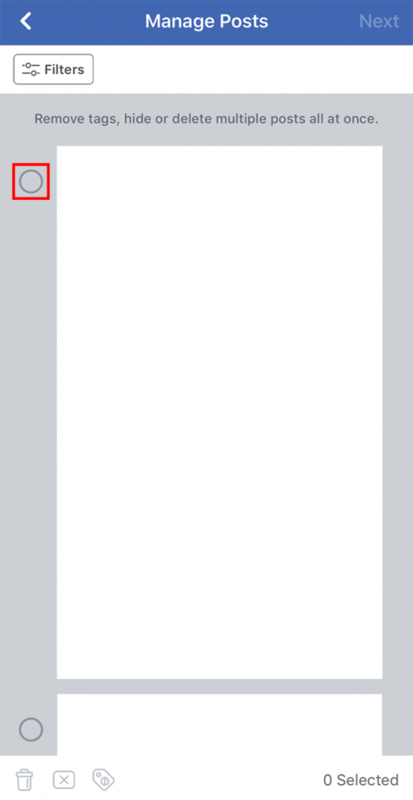 Did you know you can remove posts from your Facebook Timeline in bulk from within the Facebook mobile application? 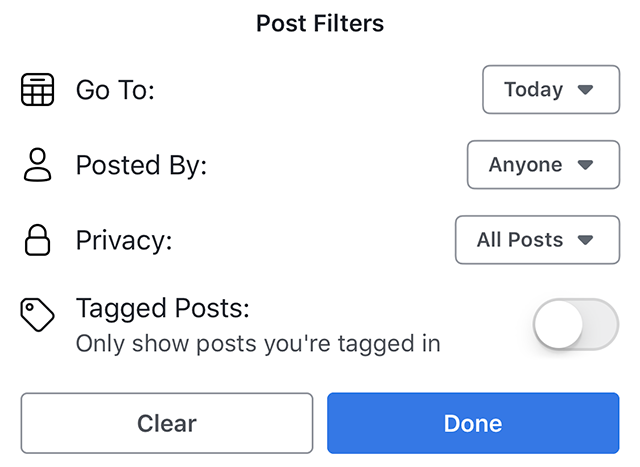 This includes the ability to delete or hide posts that you’ve previously shared, as well as to remove your tag from posts you’ve been tagged in by other users. Our guide will show you how this feature works. Note: These screenshots were captured in the Facebook app on iOS. Step 1: Near the top of your Facebook News Feed, tap your profile picture to go to your profile. Step 3: Tap the circle to the left of each post that you want to delete/hide from your profile. Also note, you can tap the “Filters” button near the top-left corner of the screen to filter your view to only see posts that you personally shared, only posts that you’re tagged in and so on. Step 4: Once you’ve selected one or more posts, tap either “Next” in the top-right corner of the screen, or the three icons in the bottom-left corner of the screen to continue. Step 5: At the bottom of the screen, tap “Delete Posts,” “Hide from Timeline” or “Remove Tags,” depending on what you want to do. 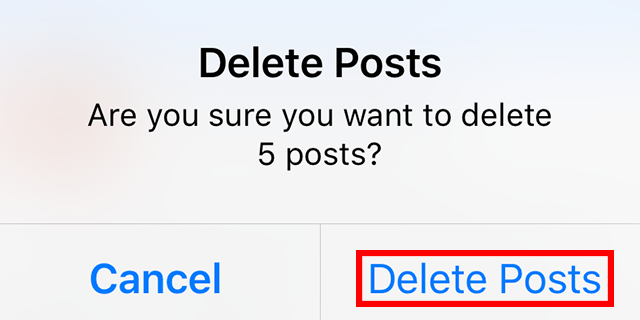 Note: If you’re trying to delete posts but the “Delete Posts” option is in gray text, rather than black, it means you accidentally tapped a post that Facebook won’t allow you to delete. Examples include notices that you’ve changed your profile or cover photo and posts that you may have shared from within a Facebook game. 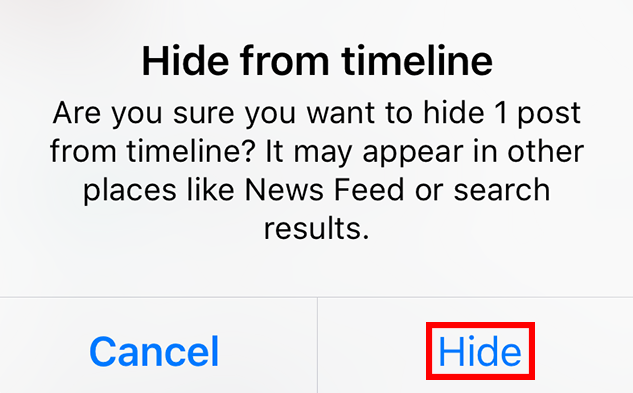 You can only remove these posts from your timeline by tapping the “Hide from Timeline” option. Step 6: Tap “Delete Posts,” “Hide” or “OK” on the confirmation window that appears. The window that appears will be determined by the option you tapped in Step 5 above. Instagram is one of the most popular social networks, with a staggering 800 million users globally. The photo-sharing network is a great place to share snaps of your daily life with friends and family, and likewise see what they are up to. It’s also a brilliant place to discover images around topics that interest you – from locations to animals, food and celebrities. If you’ve tried Instagram and think it isn’t for you or you just want to get rid of it, you might be wondering how to delete an Instagram account. If you use the app it’s not obvious how to do it. Follow the instructions below to delete Instagram. Bear in mind that once you delete your account, all your photos will be removed permanently, so you may want to think about temporality disabling it instead. We'll show you how to do that too. You can’t delete Instagram using the app - it has to be done via a web browser, either on a smartphone, tablet or PC. 1: Go to Instagram’s Delete Your Account page and enter your username or email and password. 2: Next to ‘Why are you deleting your account?’ use the drop-down menu to select a reason. These include ‘Privacy concerns’ and ‘Too busy/too distracting’. 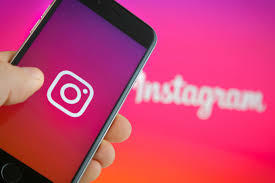 3: Instagram will try and keep you by making suggestions, but if you are determined to leave, re-enter your password in the box below and click Permanently delete my account. Temporarily disabling your account is a good solution if just want a break from Instagram, but don’t want to lose your photos, or think you might come back to it in the future. 1: Head to www.instagram.com/accounts/remove/request/temporary/. Instagram will warn you that can only disable your account once a week. 2: Select a reason for disabling your account from the drop-down menu. 3: Re-enter your password and click ‘Temporarily Disable Account’. Facebook Messenger continues to improve and innovate as the app matures. It takes on messaging giants like Viber and Skype while strengthening its connection with the core Facebook experience. With voice and video calling, easy media sharing, the very useful Chat Heads interface, and additional tie-in applications like GIF Keyboard and fun games for people to play, there's a lot to do in Messenger, and the future looks bright. That said, for all the features and communication capabilities that it offers, performance is a big issue for many devices, with other apps sometimes slowing to a crawl while Messenger or Chat Heads are active. It's a minor quibble that can be resolved by closing the app or swiping away the Chat Heads, but it deserves recognition and attention from developers. Messenger is a free messaging application that works with the Facebook social networking platform. With Messenger, you can send and receive private messages with your Facebook contacts right from your phone. You can also share multimedia files like videos, photos, and audio clips with your friends, and even send fun Stickers to liven up conversations. There are hundreds of different stickers to choose from, featuring famous characters, emotes, and others, with more added all the time. Start Group Chats and participate in larger conversations. Name your conversations, share photos and easily find what's been shared. Like Viber, Messenger allows you to contact people in your phone's address book for free, using your data plan to send messages or make calls. The app can even take over as your default SMS app. Chat Heads allow you to communicate with several people at once away from the Messenger app, allowing you to work on other apps and still stay in touch. This teaches you how to hide your phone number from public viewing on Facebook. This process is different than removing a phone number entirely. 6. Tap Edit to the right of the Contact Info heading. 7. Tap the icon to the right of your number. Open the Facebook app. It's the white "F" on a blue background icon. If you're logged in, doing so will open your News Feed. If you aren't already logged into Facebook, type in your email address (or phone number) and password and tap Log In. Tap ☰. It's in either the bottom right corner of the screen (iPhone) or the top right corner of the screen (Android). Tap your name. You should see it at the top of the menu here. Doing so will take you to your profile page. Scroll down and tap About. It's below the information section that appears underneath your profile picture. Tap Contact Info. You'll find this option below the list of profile information that's at the top of the page. It should have "Mobile Phone" listed beneath it. Scroll down and tap Edit next to the "Contact Info" heading. This section's location will vary based on the information you have on your Facebook page, but it should be above the "Basic Info" box. Tap the box to the right of your phone number. You'll see your phone number at the top of this page underneath the "Mobile Phones" heading. Tap Only me. This option is near the bottom of the pop-out menu here. Setting your phone number to Only me keeps it on your profile so you can continue to use Facebook Messenger, but only you will be able to view it. You may have to tap More Options ... to view the Only meoption. Open the Facebook website. If you're logged into Facebook, doing so will open your News Feed. If you aren't logged into Facebook, enter your email address (or phone number) into the top right corner of the screen and click Log In. Click on your name. It should be in the upper right-hand side of the Facebook page. Click About. It's located under your Cover Photo. Hover your cursor over the phone number. You'll find this option in the upper right side of the "About" page. Click Edit your contact and basic info. This option appears when you hover your cursor over the phone number. Click Edit to the right of your phone number. The Edit button won't appear until you move your mouse cursor over the "Mobile Phones" box. Click the padlock icon. It's directly below your phone number. Click Only me. This option is in the drop-down menu that appears. Doing so will keep your phone number on your profile so you can continue to use Facebook Messenger, but only you will be able to view it. You may have to click ▼ More Options at the bottom of the drop-down menu first to see the Only me option. Whether you’re concerned about your online privacy or just getting tired of constant status updates from old school friends that you’ve since realised aren’t actually that cool, there are plenty of reasons why you might want to delete your Facebook account – and it’s not as hard as you might think. In this guide, we’ll walk you through the process of how to delete Facebook step-by-step, including outlining the difference between ‘deactivating’ your account, and deleting it entirely. If you’re thinking about deleting your account then you’re not alone. Between the Cambridge Analtyica scandal and increasing worries about the effect social media has on our individual and societal health, people are increasingly turning away from these sites that have come to dominate the internet. 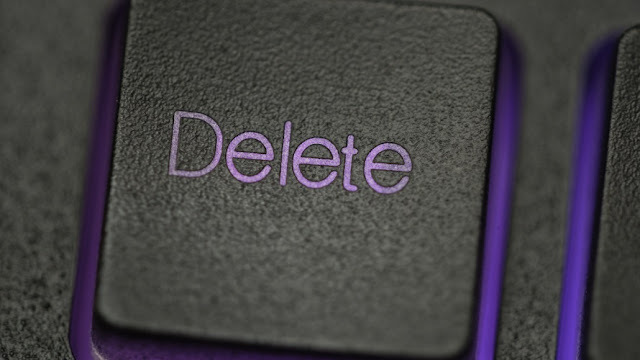 Whatever your reason, deleting or deactivating your account is actually pretty easy. Here’s how you do it. To reactivate your account after deactivating it, simply log into Facebook your e-mail and password. Your profile will be entirely reinstated. 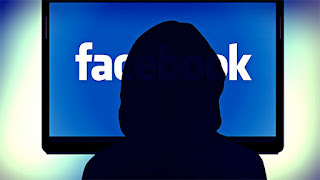 Deleting your Facebook account is a serious decision, so make sure it’s something you really want to do. Whether you like it or not, social media is ingrained in society, and your Facebook profile can affect friendships, job prospects, and social opportunities. Remember that there are also ways to secure your Facebook privacy settings., if that’s your particular concern. Plus, you may miss out on some ‘dank memes’ by deleting Facebook, and however grating it is in places, it’s also useful for plenty of things, such as keeping up with friends from abroad and organising events. You see questions can come in several ways, so do the answer. Direct Answer: There are several ways to do that, supposing you are using the Facebook application or lite or whatever browser you are using. Facebook has this save password option for its user anytime you login, Facebook asks if the current password should be saved for easier access. Lucky for you if you’re using this you can login without inputting your password. Firefox also offers a master password for all logins on the app, if you’re using it, then lucky for you. Indirect Answer: Imagine your self having a house without keys, even dog cages have keys. So also will Facebook be insecure without passwords, Facebook even allows for 2-factor authentication since password seems to be failing these days. To stop beating about the bush if you lost your password, use the forget password button below the login page. The password will be sent to your email or Facebook or friends if you have the feature enabled. You must be at least 13 years old to create a Facebook account. Enter the name you go by in everyday life. Enter your mobile phone number or email. Create a password you'll remember. Select your birthday and gender. If you're having trouble with your password, learn how to reset your password. If you still can't log in, find out what to do next. 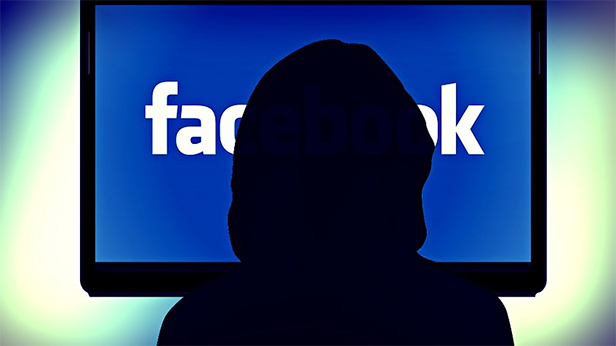 If you are new to Facebook then upload your contacts and Facebook will do the rest. To do this you will need to get a .csv file of all your contacts . In Outlook you simply export, Gmail you go to contacts and look for export in the settings menu, Hotmail is the same and if you are on Mailfor the Mac then follow these instructions. Instagram quickly outgrew its first impression as a fun app for kids and has become a serious content marketing, networking and audience building tool for individuals and brands. It's one of the most popular social networking sites on the planet, with over 200 million active monthly members sharing 60 million images and 1.6 billion likes per day. You can't argue with numbers like that. But that's just average. And as I advocate across all manners of online marketing, you don't want to be average! It's not a dream or a goal. Sure, 58 times greater engagement than Facebook sounds great, but you can do so much better than that on Instagram. Whether you're a big brand or maybe just wondering how to become Instagram famous, I don't want you to strive for average; I want you to reach for the stars and become an Instagram unicorn. A digital unicorn is that magical, rare creature that outperforms all others by orders of magnitude. And you're going to accomplish this by working these eleven amazing Instagram hacks into your social strategy. Check out these attention-getting ideas for your Instagram captions, hashtags, profile, and more, and see what to post on Instagram to get more followers and way more visibility and engagement too. That's nice that you created a #joesgarage hashtag for your company, but who knows to use it to share content about you? Make sure it's in your profile, but take the game offline and have it printed on your receipts, in print ads, on signage in your store and at relevant events. If you're on radio and TV, direct people to use your hashtag. Integrate online and offline campaigns by ensuring it's listed on your other social profiles, on your website, and in your email blasts. Don't just hope people will find it. It's prime real estate on your Instagram profile... do you really want your bio to only link to your website homepage, now and forever? Yawn. Change it up at least bi-weekly and use that clickable link in your bio to drive traffic to your newest or most popular content. A picture is worth a thousand words, but you can't skip the words entirely. National Geographic is fantastic at using storytellingalongside their Instagram photos to generate engagement and sharing. While traditional media brands have dropped like flies, NatGeo has thrived across digital and become one of the top brands on Instagram, with over 50 million followers. Like the other Instagram hacks I've included here, this is something you'll want to commit to working into your strategy over time, so don't worry if it feels weird at first. Your writing will improve as you find your brand's Instagram voice. Visit the profiles of each person you've identified as an influencer in your space (AKA a person who influences the people you want to get in front of) and "Turn On Post Notifications" to be notified every time they share new content. You can then interact with them regularly and become one of their favorite people or brands. If you only want to feature the best user-generated content about you or your brand on your Instagram profile, you can. Now, you can't remove the tagged photos from the site entirely, by choosing "Edit Tags," selecting the ones you want to remove and choosing "Hide from Profile" (you may need to confirm). It does the trick. 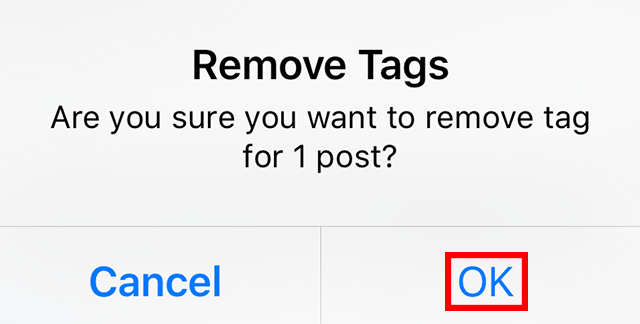 Speaking of giving you greater control over which tagged photos appear on your profile, you can change your Instagram setting so tagged photos won't show unless you approve them first. You'll find this under "Options," "Photos of You," and "Add Manually." I'm trying to think of a reason why any company would NOT want to do this... Nope. I've got nothing. You should absolutely set this up to avoid potentially embarrassing situations. See what's going on in a specific area (say, your neighborhood, a city you're targeting in ads, or even an event in a certain location) by going to the search page and choosing the Places tab. Then, type in the name of the place to see all geotagged posts for that location. Instagram, like other social networks, is a conversation, not a broadcasting platform. What action do you want people to take on your post? If you don't know that, start over and figure it out. Staples is great at generating engagement by letting people know exactly what they expect them to do with their posts (bonus points if you make it sound fun). Often, that call to action cleverly gets people to share or virally spread Staples' content. Don't want a tagged photo of you or your brand on your profile? Edit Tags to hide images from your profile. Adjust your settings so any potentially embarrassing tagged photos won't show without your approval. Visit the Places tab to see what's happening locally - your neighborhood, a city you're targeting in ads, or an event in a certain location.